Northwestern islands, across the length of the lagoon from Fedraey. 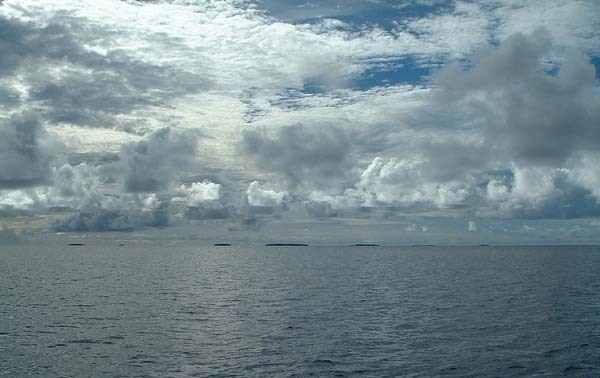 While these islands appear all in a row, some are much closer, others further distant. It takes a keen knowledge of the lagoon and its islands to know what exactly you are seeing. See a map of this view. “We have boundaries in the lagoon,” Serphin begins, relating some of the intricate relationship between Ulithian society and the waters enclosed by the islands. 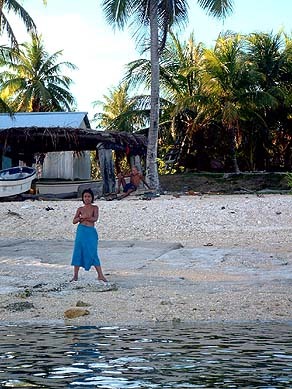 In this atoll environment, the limited land area and large lagoon make for a complex relationship between society and the sea. Serphin, Manuel and Philip explain how the lagoon is divided, the protocols for traveling in the lagoon, and the system of overseers called raat. "The different areas of the lagoon not only belong to an island but they belong to a clan, high clans," Serphin continues. "These areas have names. It’s like gardening: people have names on their gardens and taro patches; it’s similar with the lagoon. So certain parts of the areas belong to different clans. "For example, on Mogmog, we have four or five clans that are the owners of those fishing ground areas. It’s illegal to fish there without permission: you have to tell those people that belong to that area, that you are going fishing. "And a long time ago, if you asked for permission to fish in one place, that meant that’s the only place that you’re going to fish. You’re not going to go to some other place that you didn’t ask for." A hammock sways under this seaside shelter on Falalop. A child watches from the shore on Mogmog. “Now a long time ago, we had only canoes. That’s not a fast type of transportation because you have to do so much tacking back and forth. Now that we have boats, transportation is faster here. "But if you don’t ask for those areas, you cannot go just there, even though there’s no fish in the area that you asked to go. And, if you catch a fish from this area, when you come back, you have to give at least two fish for the owner. Still today, we are still using that. That’s the payback for the owner of the place that you were fishing." “Different islands control parts of the lagoon,” Manuel adds. “For example, Fedraey island, they have their own place somewhere near for fishing. So if people from Mogmog want to fish in here, they have to ask permission from them. Each one of these islands, they have their own areas." 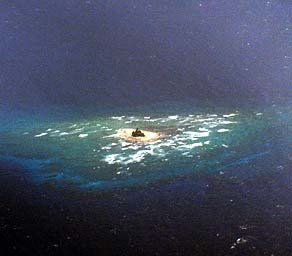 Approximate boundaries in the lagoon, after Ushijima (1982). “The shallow places within the lagoon are very important markers for understanding who is the owner of this area," Serphin says; "who it belongs to, this island and this part of this reef. So they have to fish and do not go to that, that distance. Because here you can point, point out the place that you’re going to fish by looking at the islands. You get your bearing from the islands. "But that’s hard to do, we don’t have the GPS here so, it won’t be exactly the right spot. That’s the only place that you point out or estimate where you’re going to fish. And remember, the longer the distance, the less accurate your sightings using the islands. It will make a big difference where the spot is that you stay. So the place where you going to fish is not accurate. "And that’s why we point out those reefs, small reefs, to tell you a little more accurately where you’re going to fish. You can see those from the boat by the color of the water. “There is a line coming from Potoangroas out to a certain reef out here,” Serphin continues. “If you’re coming from Fedraey going to Falalop, you know that you cannot enter this boundary here. So you tack from further out. If you enter this area, you have to go to Mogmog and report your canoe. "And also when you come to Falalop from Potoangroas, you go straight from Falalop to a small reef out here—that’s the boundary. So you have to pass outside that reef in order to go to Potoangroas"
Shallow spots within the lagoon are apparent in this portion of the map. 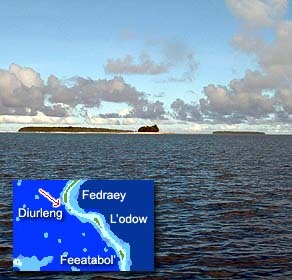 Tiny Maaes island marks the edge of the lagoon in an otherwise island-less stretch between Falalop and Mangeyang. “If you don’t report your canoe, they will come up to you and confiscate your canoe. Long time ago, Sohl’oay, and Mangeyang were the policemen for Mogmog, because Mogmog is the highest ranked island. So they kept watching canoes moving through this area." 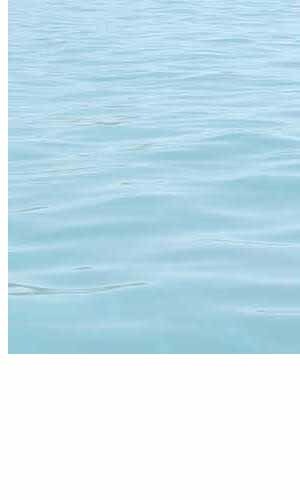 “If you were out in a boat," Manuel says, "you would look at the different islands to know if you’re in the right part of the lagoon. And if they catch us in their part of the lagoon, we have to pay them lavalavas." “Suppose you can go from Falalop to Fedraey. You have to follow the routes. Don’t go outside that 'road,' otherwise they will stop you. There are specific routes, and you cannot go outside them. For example, when a guy from Falalop wants to go to L’odow and he just starts sailing from here, going across straight without stopping, he’s going to get it. He has to stop at Fedraey. They’ll say ‘okay fellow, now, you did something no good.’ So we surrender and pay them with lavalavas. ‘Don’t do that anymore’. Knowing where you are in the lagoon. The arrow on the map indicates the direction you are looking. Diurleng (center) is the nearest, then L'odow (left) and Feeatabol' (right). “Even if you go from Falalop to Mogmog, then you will pass by Asor, and there’s a certain route that you have to follow. If you go outside that certain place, they’ll stop you and ask ‘Why, why you did that?’ All of these islands, they have a custom like that. Except for myself on L'oosiyep, because that island belongs to my father. If I want to go to L'oosiyep, no problem, I don’t ask anybody. But if somebody was there without permission from me, I say ‘now stop, don’t go any more. You pay me’." 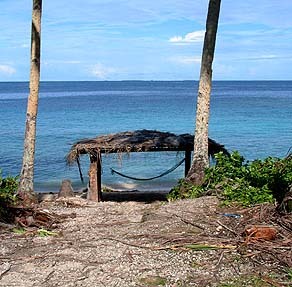 “In the Ulithi Atoll, we have what we call raat." Philip explains the "officers" that oversee the lagoon. "Faaelmey clan, where Chief Taithau sits, they are not just the overall supervisor of all the mtaang in Mogmog, but also the overall supervisor of all raat in Ulithi. So Faaelmey is the raat on Mogmog, and there is one on Sohl’oay, next to Mogmog, called Luugl'ap. And there is one on Falalop that we call Faaelmwog. And then one on Mangeyang we call it Moerooech. 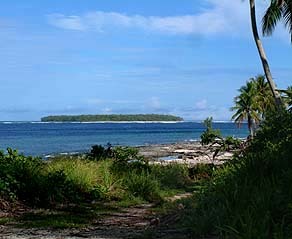 And another one on the Turtle islands in the East we call it Yaaor moa Giil'ab. "These clans on each one of these islands supervise certain parts of the atoll. For example, Luugl'ap has the jurisdiction of this part of the reef, in the northern part. It goes all the way down to the channel there near the last island on the reef, and it comes all the way to the channel near Mangeyang. That’s that part of the atoll is under jurisdiction of Sohl’oay, of Luugl'ap." Asor, as seen from the coast of Falalop. “Then from there it goes all the way around to meet Sohl’oay’s jurisdiction on the West – that’s for Moerooech in Mangeyang. They supervise that part. Each family owns some islands and some parts of the reef, but the overall supervisor is those raat. Then on Falalop only the reef around Falalop is supervised, it’s under jurisdiction of Falamo. And the whole reef in those islands over there—L'oosiyep, Yoar, Giil'ab, and Bulbul—are under the jurisdiction of a clan in L'oosiyep called Yaaor moa Giil'ab. “Each year at certain times, all these raat will meet on Mogmog—the regular people, they don’t even know that there is a meeting. These raat will get together in the King’s house, not in the Men’s House. They will decide about fishing, they will decide about how to keep peace on each one of these islands, they decide many things. Like a trip to Fais and Yap, on groups of canoes, all of this they’ll discuss. And what type of fishing will be done this part of the year and what is to be stopped." "And we just listen, we cannot ask questions. We cannot make suggestions. And whatever he said, we will do it. Most of these raat and the mtaang will have knowledge – they have knowledge of people’s land, they have knowledge of people’s genealogy, they also have knowledge of navigation, making canoes. When you are a chief you must be knowledgeable in all of these things." Now that this overall administration of the lagoon has been reviewed, a consideration of specific activities begins with beaches.